We’d love your help. 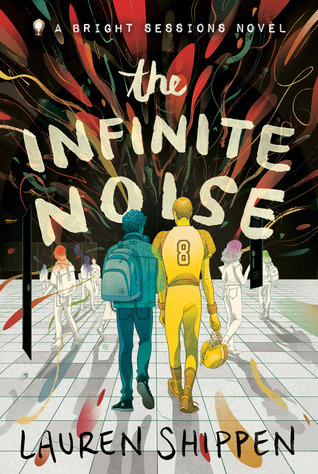 Let us know what’s wrong with this preview of The Infinite Noise by Lauren Shippen. From Lauren Shippen, the creator of the beloved and award-winning podcast The Bright Sessions, comes the first novel in a series that follows the struggles and discoveries of three teenagers with supernatural abilites who end up on the couch of Dr. Bright, a mysterious therapist who specializes in atypicals. "What if the X-Men, instead of becoming superheroes, decided to sp From Lauren Shippen, the creator of the beloved and award-winning podcast The Bright Sessions, comes the first novel in a series that follows the struggles and discoveries of three teenagers with supernatural abilites who end up on the couch of Dr. Bright, a mysterious therapist who specializes in atypicals. To ask other readers questions about The Infinite Noise, please sign up. how can something be this good? BOOK BASED ON MY FAVORITE PODCAST!! Everybody go right now and listen to the podcast this book will be based on, The Bright Sessions. I promise you won't regret it. It's literally just about people with superpowers going to therapy and I love it with all my heart. It features LGBTQ+ rep, mental health rep and characters you can't help but fall in love with. Also the superpowers. What more could you ask for? Full review to come closer to release date. can you hear tears of happiness falling? I received this book early in exchange for an honest review. This book's ideas caught my attention immediately. It is the general gay teen book but with the twist of the supernatural added, something that can only make it better. That being said all gay teen books I have read seem to be missing something I cannot put my finger on and this book is no different. While the supernatural element adds to the plot it seems to be missing a crucial element to make it a 5 star book. While reading this book I received this book early in exchange for an honest review. While reading this book I couldn't help but appreciate that Caleb, an empath feeling everyone else emotions, has to tackle and understand his, something more men in the world could use. The other main character, Adam, has depression and this is written about quite acutely. Having depression myself I found that I identified with Adam's feelings and felt the this type of story needs to be read by more people to help understand the effects of depression. However Adam talks about self harm a lot, saying that he has drastically reduced it prior to the beginning of the book but still does it now and again. I really feel that with the well executed depression and teenage feelings in the book that this had to be seen rather than just talked about. this is an issue for many people and it seemed to be added in just to be inclusive. Okay, I love the world of X-men or a world where humans have special abilities and power. It is just fascinating to see how far science can go if given the proper green light when it comes to experimenting with humans. One of my favorite part of the book was the way Caleb's "superpowers" were described. I was struggling with him, especially, when it is happening to a high school student. Seriously, it's the worst time for such ability to become aware to Caleb. The way emotions were described in this book was stifling. I could feel everything Caleb was going through. You will see what I mean. It has been described to the T.
Adam also is tackling his own demons, I felt for him, the author did a great job of describing how he felt. I was vividly seeing while reading what some of us go through on a daily basis. I don't want to give away too much, but if you are a fan of the X-men series and superpowers trope, you will love this one. I can't wait to see how the story progresses fro Adam and Caleb because there is still a lot yet to be revealed. This book, at first, had me thinking I might not enjoy it. I honestly just don't relate to football or sports and Caleb, one of the main characters, was just very jock at first. But as I read on, I realized that I really enjoyed their story. I think this book also fills a gap in the YA market as a book that boys will relate to. It was a bit slow at times, and I wanted more from the Atypical plot than I got. But overall, a really good story! Get your butts ready for my review, because I'm not holding back. The love I have for this book is unprecedented. YOU ARE NOT READY. Just now tuning into the podcast and am LOVING IT!! Can’t wait to see how these characters evolve in the novels!! 08/03/19: Every booktuber/blogger needs That Book and I've decided after reading this excerpt that this book is going to be mine. 01/03/19: I would appreciate it if you could all respect my privacy in this trying time as I try to recover from this gorgeous cover murdering me. A really enjoyable podcast that can be listened to during breaks since episodes are short, but you'll want to binge read! I liked that there was a transcript too, helped to follow and calculate page count. The Bright Sessions follows Dr. Bright in her therapy sessions with Atypical humans. In the first season, there were 3 patients: Sam, Caleb and Chloe. I liked all of them! They all want to get better and are emotionally resilient. As time goes on, we get more hints that Bright is up to something. Really curious and looking forward to listen to the next season. There will be a YA series based on this as well! The podcast in general is well produced as well. Great continuation of the fiction podcast! Great character development, more characters, interaction between the 'patients', intriguing plot development and more audio media (journals, logs, voicemails)! Really grateful for the transcripts as well. I loved it during the first season but I fell in love with it during this season! The characters are darlings, even the irritating ones. They have their faults but are very real. We get to see what Bright's plan was. At first I distrusted her, then I understood. Caleb and Adam <3 The friendship between Sam and Chloe and Chloe and Caleb! Frank and the plottwists (would make a great band name) and Mark. Really a lot of content, probably more than twice the first season. There was such a variety of content as well and the ending is really 'edge of the seat' type. There are many layers to this story. More queer representation as well and different relationship types (including the importance of friendship and it was great to see two female characters acting as friends). While Sam isn't Ace/Aro (to my knowledge) I did identify a lot with her. It was really well played how everyone got involved in the plot.